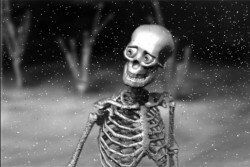 In an imaginary land that lacks of water and flesh, two skeleton figures find a pair of eyes in the sand. Their selfish minds start a fight over the eyes, and the fight leads a bitter end. Born Seoul, Korea. Lives in Breaux Bridge, Louisiana, USA. a Painter and Animator. Assistant Professor at the University of Louisiana, Lafayette, LA.